Tandem Boat Trailer Before heading to the lake, check your all your boat trailer parts, including boat trailer tires, boat trailer lights, and your boat trailer bearings so that you will travel with more assurance of safety to your favorite fishing hole. Understanding these basics of boat trailers parts will also increase your confidence and pleasure while heading to the lake. These 2 Radial Marathon Trailer tires are excellent tires, using an advanced rubber compound and extra deep treads providing travel for many, many worry free miles. The design features low rolling resistance for smooth, fuel efficient and long life during traveling. Marathon features some of the best customer reviews on the market in trailer tires. Marathon trailer tires are PFT's preferred trailer tires. Read about the difference between Bias and Radial Tires on this link: boat trailer tires where you will also read about tire codes and how to select your tires. Always check your tire tread for unusual wear and tire pressure before each trip for safety and peace of mind. Also keep track of the age of your tires because they can begin to dry rot before the tread is good. Tires are as extremely important item among your boat trailer parts. Once a year you should check your boat trailer brakes to make sure they have enough pad left to work properly. 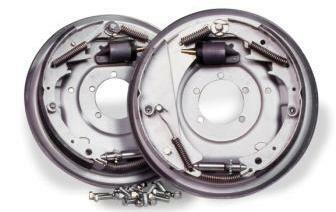 Many boat trailers will have traditional drum brakes while some will have the added stability of disc brakes. Most repairs on brakes will be to replace the pads. In addition, you should routinely check the brake fluid level to make sure you have adequate fluid for the brakes to work properly. The best time to check your boat trailer bunks is each time you launch your boat. An often overlooked item of your boat trailer parts, observe the normally unobservable - look at the trailer without the boat on it. Look for worn bunks, carpet that is loose or missing, any broken parts or sharp objects like a screw sticking out where it should not be sticking out. When you find something that needs to be fixed, plan during a fishing outing to rent a slip at a lake and park your boat in that slip and spend the time fixing your boat trailer bunk or replacing your boat trailer carpet. Before every outing you double check to make sure you have proper lubrication/grease in each wheel bearing. A hot bearing due to too little grease can cause major problems when traveling down the highway and cause the wheel to sieze up, not good! An ounce of prevention is worth a ton of cure. If your bearings have ever run dry of grease, or gotten excessively hot because they have become worn replace them. Several products are available to help prevent this from happening. If you already have your boat and trailer, and have never seen or used these Bearing Buddy products, I urge you to try them. Know the size of your axle/bearing cover because these come in different sizes to match. Click on the Bearing Buddy Link below and pick a set up; or click more on this link to read more about Boat Trailer Bearingsand the proper bearing grease to use. The Bearing Buddy protectors allow you to see and feel if the right amount of grease remains in and through your bearing. These bearing covers keep dirt and moisture away from your Bearing Buddy and provide a nice finished off look for your Bearing Buddy. Make sure you buy the right sized diameter units. These LED stop, turn and tail lights have over a 100,000 hour life expectancy. They exceed all DOT rear lighting requirements and are fully submersible. I have been systematically replacing all my lights with LED's because they are brighter, and require less energy to run. If you are ready to upgrade click on the Peterson link above. Click on this following link to read more about all the Boat Trailer Lights / Wiring that are available. Replacement boat trailer rollers are available for virtually every size, shape, and use of a roller should you need to replace one. The advanced PVC construction of Tie Down's bow roller lasts longer, won't split, crack or leave scuffs on your boat. Tired of replacing rollers? Cleaning scuff marks off your boat? Tie Down Poly Vinyl Rollers use an enhanced formula for PVC that far outperforms traditional polyurethane products and rubber. They're long lasting, cut resistant, absorb shock, and will not mark or mar your boat. Even better, volume negotiating power saves you hard-earned cash off the in-store price. If you are ready to buy a roller click on the Bow Stop Roller link above and see all the rollers they make. If you still have questions click on this Boat Trailer Rollers link and review the many different options. Most repairs of the hub and axle revolve around the bearings. However if you find you need to replace the whole hub I suggest you pick up a kit that includes the bearings as well. This is a good one. Inspect your axle, hubs and bearings at least once a year in detail. More frequently to check on loose nuts, bolts or hangers.. This Curt MFG Hitch and Ball comes in a variety of sizes and capacities. All are made for reliable towing wherever you roam. Robotically welded for accurate, consistent cuts, and clean strong weld lines. Durable double-carbide powder-coat finish resists rust and helps keep your ball mount in tip top shape for years. If you are ready for a new hitch click on the SG link above. Stay tuned for a hitch page to be added soon to review many different styles of hitches. Size does matter, so when ordering make sure you have the dimensions for your application. If you like the hitch above click on that link and order one to fit your needs. If you have addditional questions or want to see more variety click on this following link and read the Boat Trailer Hitch Page. If this is one of the boat trailer parts you are looking for be sure you know the size ball you will need to fit your boat trailer. This Curt MFG Tongue Jack comes in a variety of sizes to accomodate smaller to larger craft. Based on tongue weight, you should find the right one for your needs at Sportsman's guide. Click on the Curt Link above and enjoy this heavy-duty marine jack. Trailer tongue jacks are used every time you remove your boat and trailer from your tow vehicle. Yes, they can wear and occasionally will need to be replaced. Most require a generous portion of grease in its gear system. Check this periodically and refill when needed. This will usually provide you with a long life for your trailer tongue jack. In addition, most trailers will not come with a jack for replacing a flat tire. So, be sure to have one of the many versions available for your use should you need one. Read the following page to gain a better understanding of the variety of choices you will have when it comes to Boat Trailer Tongue Jacks or Flat Tire Jacks.